The Dutch Hook Bill duck was a mystery to me when it first seemed to ‘appear’ in Britain about 10 - 15 years ago. 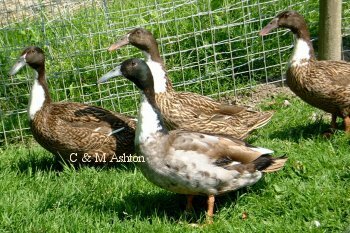 In fact, the older specialist ducks breeders knew it well but the breed had ‘lapsed’, both here and on the continent. That did not seem surprising. This really is a peculiar looking duck. Not only does it literally have a hooked bill which forms part of a curve around the whole of the top of the head, but its legs are not set as squarely as in the mallard. This gives the Hook Bill a characteristic funny walk. Once you have got these birds, they tend to stay. 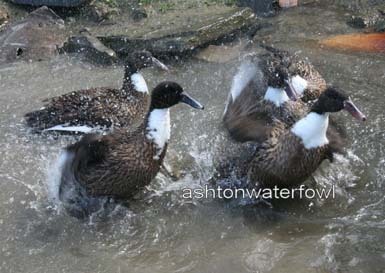 Placid, docile, gentle and friendly, they are beautiful ducks with real character. The Dutch masters, such as Jan Steen, painted many pictures of poultry and waterfowl, and this is one of the ways in which information is gleaned about our old breeds. Steen’s ‘The Poultry Yard’ (1660) depicted white and mallard-coloured crested ducks, a fawn-&-white pied duck and a bibbed. Melchior d’Hondecoeter (1636–1695) also portrayed crested ducks, and he included a crested Hook Bill. Several of d' Hondecoeter’s other paintings can be seen at the Rijksmuseum in Amsterdam , and in the National Museum of Wales at Cardiff . 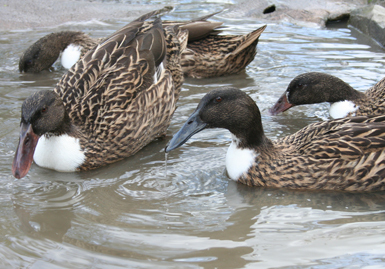 The first written evidence of Hook Bills may be in Willughby’s Ornithology of 1678 when the Hook Bill was described ‘as very like the common duck, from which it differs chiefly in the bill, which is broad, somewhat longer than the common duck’s, and bending moderately downwards, the head is also lesser and slenderer. . . it is said to be a better layer’. Nobody really seems to now where the bird came from. Harrison Weir (1902) wrote that the breed was of Eastern origin, citing India . The Dutch Historian van Gink also said that they were from the Far East and there is some acceptance in Holland that the most likely place of origin is East Asia from where they were taken and brought to the Netherlands by Dutch seafarers in the ‘Golden Age’. In the 1700s, Hook Bills were kept by the hundreds of thousands in the province of North Holland. The Dutch method of keeping ducks did not actually cost the owners anything: the ducks went off in the morning to the rivers and canals to find food and returned home before dark. The birds were expected to fly quite a large distance to find their own food so, by necessity, they could not be heavy. As in Britain, wild duck was a good source of meat. So it has been suggested that the hooked bill itself may have been created from a natural mutation so that the birds could easily be distinguished in flight from the wild mallard. Hunters could then avoid shooting the domestic birds on their way home at night when the mallard might be caught. To make their identification in flight more certain, it has also been suggested that the white-bibbed Hook Bill was created. Harrison Weir described ‘bow-billed or hook-billed ducks’ which were kept on the lake at Surrey Zoological Gardens between 1837 and 1840 when ‘they were the ordinary colours, mostly being white or splashed with red, yellow and brown or grey. The carriage was somewhat upright, and the necks and bodies long and narrow’. He also commented that years after, far better birds were shown at Birmingham ; these were white with clear orange-yellow bills, shanks and feet and had a top-knot towards the back of the skull. They weighed about 6 lbs. Wingfield and Johnson (1853) also noted that white Hook Bills, imported from Holland were the type most often seen, but coloured specimens were not infrequent. Since then, references have been scarce but the breed did begin to make a bit of a comeback in the 1990s. It will probably always be kept only by a few waterfowl breeders and exhibitors, which is a pity. It is a good layer if not too inbred. 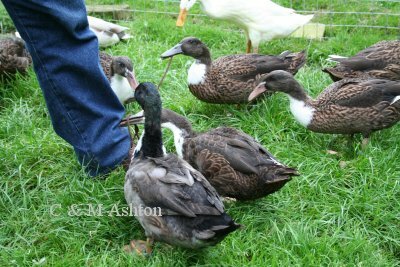 More information on duck breeds and duck management in The Domestic Duck, Crowood press.